Kathy and Stella Young personify the “like mother, like daughter” axiom — both petite, dark-haired, glasses-wearers who appreciate a good cup of coffee — and attend NMC together. Kathy, 47, is returning to complete a degree she started almost 30 years ago. Stella, 17, is getting a head start on hers as a dual-enrolled high school student. 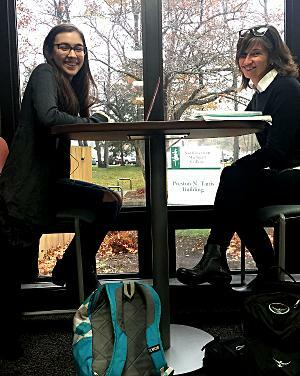 “My friends are saying, ‘You’re going to college with your mom?’ I’m like, ‘that’s fine, I like my mom!’” said Stella, a senior at Glen Lake High School. 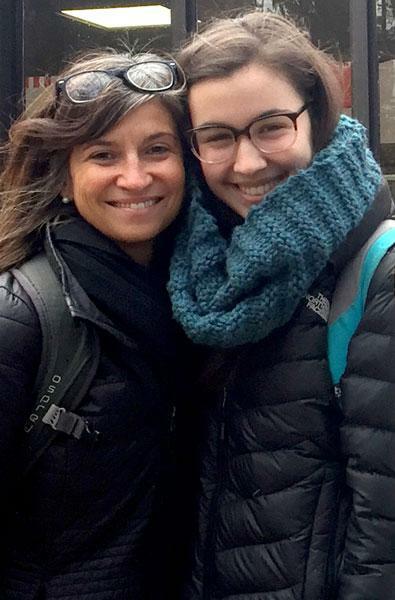 “It’s mother-daughter bonding time,” Kathy said of their shared Thursday commute from their home in Empire, which includes a stop at their favorite coffee shop, Black Market in Traverse City. She’s a “lifelong learner” who started at NMC after graduating from St. Francis High School in 1988, returned again in the 1990s and again for another class in 2005. But the demands of family — Stella has a younger brother — and the family business, Food For Thought, which she started with husband Timothy, a 1982 NMC alumnus, always kept her from finishing. Fast forward to 2016. Kathy had phased out of her role with the business. A three-month recovery from back surgery gave her time to consider what she wanted to do next. Her dream, she decided, was a master of library science degree. She started this semester with classes to complete the step in between, her bachelor’s in English. The downside is that her classes are required courses in subjects like science, which have faded over the years. She’s on campus three days a week and takes the other class online, flexibility she appreciates. Stella, meanwhile is on campus two days a week, taking classes in English, math and history. Between NMC and credit she earned at a semester-long boarding school in Wisconsin during her junior year, Stella will graduate high school with 28 college credits.